We offer our clients world class Horizontal Flow Wrap Machines. These machines offer flawless wrapping of varied food products. Further, these are manufactured using premium quality stainless steel to ensure durably finished. These ensure center and pillow type sealing of the packaging. Customization can be availed in terms of sizes and dimensions, at affordable prices. The capacity of the machine is dependent on the size of commodity to be wrapped. The speed will vary from 60 to 120 packs per minute. Any heat sealable laminated film such as Polyester/Poly , Polyester/Met Polyester/Poly, Bopp/Foil/Poly , heat sealable BOPP , pearlised BOPP etc. 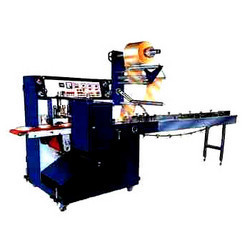 The machine can wrap all kind of commodities such as Biscuits, Candies, Wafers, Chocolate, Bars, Chewing gums , Soaps , Instant Noodles , Dry cells , Facial paper , Crackers and any other rectangular , square, round or irregular shaped products. Motor 1hp, 220volt, Single Phase, 50Hz. Suitability to pack variety of solid Shapes & Material. Capacity to pack variety of sizes with high speed & safety. Pouch cut-off length can be calibrated by hand wheel.